Made from carrots and dates, this recipe is very easy to make and delicious to eat. Dates- 5 to 6 nos. • Add all the ingredients in a deep bowl and whisk well. • Deseed and chop the dates and keep aside. • Grate the carrots and place them in ice cold water for 10 minutes. • After 10 minutes drain and keep them aside. • Place the lettuce in ice cold water for 10 minutes and drain it thoroughly after 10 minutes. • Break bite-sized pieces of the lettuce and spread them in a salad bowl. 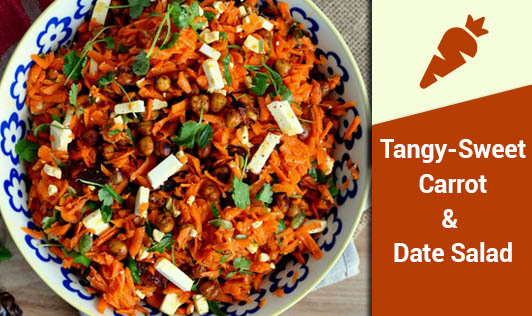 • Into the bowl, add the grated carrots, dates, almonds, and dressing, and mix them all together. • Spread the carrot-almond mixture over the lettuce leaves. • Refrigerate for an hour.